Underdog Landscape Supply has been providing Mulch and Topsoil to customers in the Philadelphia, Conshohocken, Main Line, Chester County, and Eastern Montgomery County areas since 1994. We have the best quality of product available and specialize in the customer’s landscaping needs first. Contact us to schedule your delivery of Mulch and Topsoil from Underdog Landscape Supply today, or come visit us at our location in Conshohocken, Pennsylvania! Bark mulch is one of the most popular mulches around because it looks so great once you put it down. Bark mulch is an excellent choice for water conservation as it provides a solid wood barrier against moisture evaporation. Underdog Landscape Supply provides bark mulch for customers and is available by pick-up or delivery. For more information on our bark mulch, contact Underdog Landscape Supply today! Underdog Landscape Supply provides hardwood for customers and is available by pick-up or delivery. For more information on our hardwood, contact Underdog Landscape Supply today! Right Dress Licorice Root Mulch is the original and only Licorice Root Mulch. Right Dress Licorice Root Mulch is carefully shredded mulch, creating unique interlocking fibers that resist blowing away or even washing away. It is 92% organic, sterilized of weed seeds, inhibits weed growth, absorbs and retains moisture, enhances the soil, and aerates soil for better grown and drainage. Underdog Landscape Supply provides right dress licorice root mulch for customers and is available by pick-up or delivery. For more information on our right dress licorice root mulch, contact Underdog Landscape Supply today! Black Dyed Mulch offers customers more options, Black Dyed Mulch from Underdog Landscape supply not typically available in naturally colored all-bark or cedar products. This material has quickly become a popular product for customers who are looking for a longer lasting, moderately priced alternative with vivid color contrasts for residential and commercial applications. All dyed mulches are easy to handle and provide the same moisture conservation, temperature moderation, erosion abatement, and weed control characteristics as hardwood bark and cedar mulches. 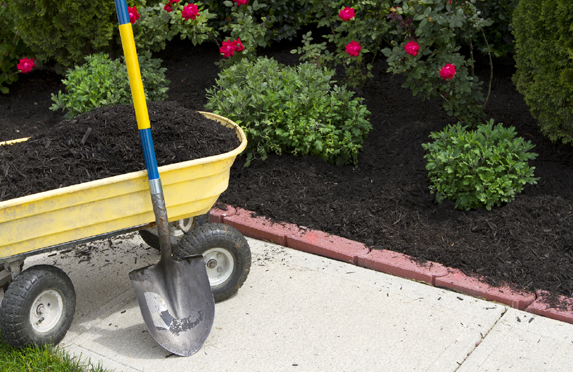 Underdog Landscape Supply provides black dyed mulch for customers and is available by pick-up or delivery. For more information on our black dyed mulch, contact Underdog Landscape Supply today! Brown and Red Dyed Mulches offers customers more options not typically available in naturally colored all-bark or cedar products. This material has quickly become a popular product for customers who are looking for a longer lasting, moderately priced alternative with vivid color contrasts for residential and commercial applications. All dyed mulches are easy to handle and provide the same moisture conservation, temperature moderation, erosion abatement, and weed control characteristics as hardwood bark and cedar mulches. Underdog Landscape Supply provides brown and red dyed mulch for customers and is available by pick-up or delivery. For more information on our brown and red dyed mulch, contact Underdog Landscape Supply today! Playground mulch is a softer type of mulch, ideal for playgrounds or play areas that children might be playing in. This mulch is much softer and sometimes even rubber to ensure a child’s safety in case of an accident. Underdog Landscape Supply provides playground mulch for customers and is available by pick-up or delivery. For more information on our playground mulch, contact Underdog Landscape Supply today! Topsoil is the upper surface of the Earth’s crust. Screened Top Soil from Underdog Landscape Supply is mixed with minerals and composted material which creates a nutritious substrate for plants to grow in. In landscaping, fresh topsoil is used for planting in gardens and flowerbeds. Bagged topsoil is basically a package of compost which is a good soil amendment. Underdog Landscape Supply provides topsoil for customers and is available by pick-up or delivery. For more information on our topsoil, contact Underdog Landscape Supply today! Mushroom soil is the soil that is a byproduct of Mushroom Soil of the Mushroom factories, a dark nitrogen-rich soil used in a garden. Mushroom soil is typically used as a natural fertilizer that replenishes all the nutrients that crops require. Underdog Landscape Supply provides mushroom soil for customers and is available by pick-up or delivery. For more information on our mushroom soil, contact Underdog Landscape Supply today! Underdog Landscape Leaf Compost from Underdog Landscape Supply provides leaf compost for customers and is available by pick-up or delivery. For more information on our leaf compost, contact Underdog Landscape Supply today! Underdog Landscape Supply provides Infield Mix and is available by pick-up or delivery. For more information on our infield mix, contact Underdog Landscape Supply today!